A few hours after my sister and my niece got to Disneyland the girls had appointments at the Bibbidi Bobbidi Boutique. 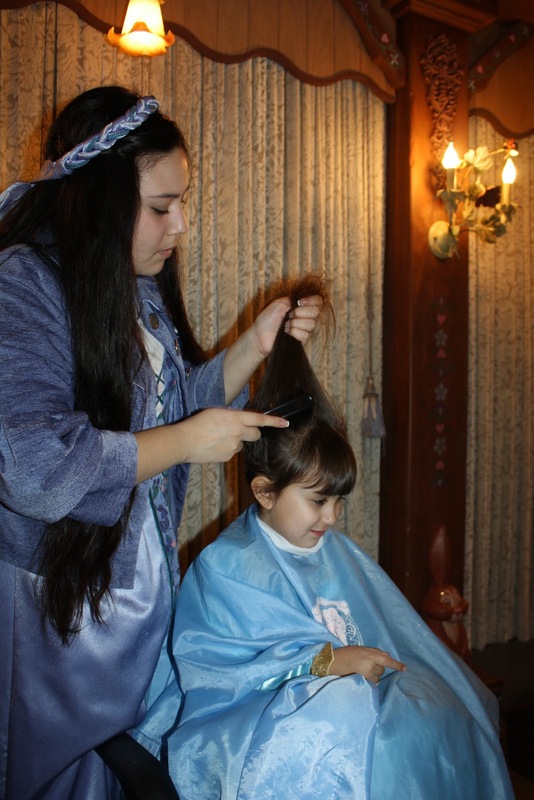 The gist of the place is that you get to get your hair, make up and nails done by a Fairy Godmother in Training. It's pretty cute. Again I was uncertain how this was going to go down. They couldn't have Hailey stay in her wheelchair so I put her on my lap and sat in the chair with her. We told her that we are going to get princess hair and right away she wanted her hair to be PINK. She's always wanted pink hair. She gets that from her Aunt Sasha. Olivia was very excited to become Merida! So during my conversation with our Fairy Godmother in Training she had asked if we had done the boutique before. I had said no, that this was our trial run for our Make a Wish that we are doing in April. She had also asked if we saw the 2 newest princesses Rapunzel and Merida. They each have their own "Area/houses." I had said no the lines for those princesses are way to long and Hailey needs to be hooked up to her feed and have medication back at the hotel soon. Our Fairy Godmother had said that she would love to take the girls over for a special meet and great if we had time for that. I said we'd appreciate it. 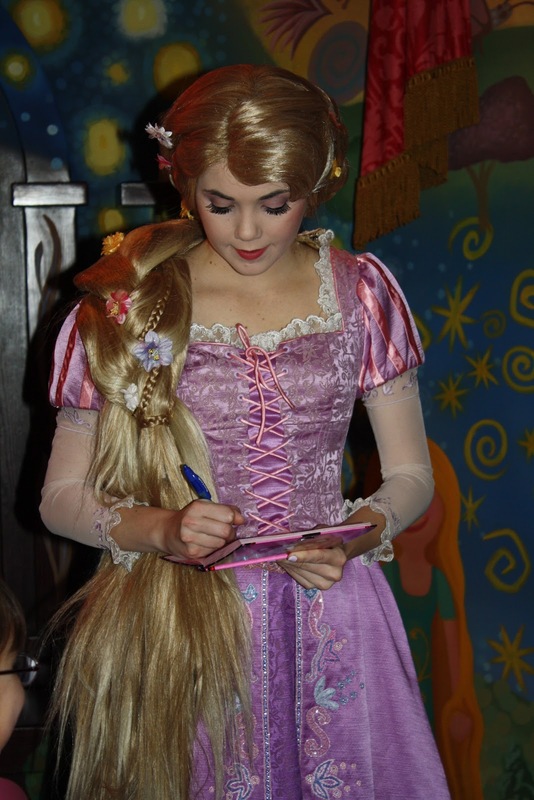 She took us over to see Rapunzel who was about to go on break first. Hailey had just watched her movie the night before and was pretty excited to see her. Olivia had her stuffed Pasqual and he got in the picture too! As this picture was being taken our Fairy Godmother started to cry. I gave her a hug and I said thank you for this! It means a lot to all of us. She said it was such a small thing but she was happy to do it. The smile Hailey had was thanks enough for her. Merida was up next and she was a lot of fun! I loved her accent and her hair was amazing! LOL!! Merida was really sweet with Hailey and took extra time with her! They had asked us if the girls could go meet Ariel, Cinderella, and Snow White before we left. Our answer, "OF COURSE!!" This was amazing! Thank you to Hailey's Fairy Godmother for doing this for us. You have a place in our heart!